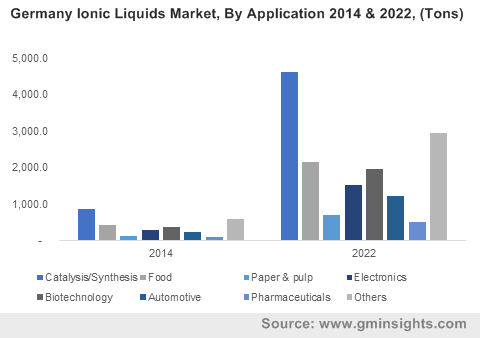 Ionic liquids market size is anticipated to be over 50 kilo tons by 2022, growing at a CAGR of over 22%. Shift in focus towards adopting green solvents owing to toxicity concerns from their organic counterparts is likely to drive ionic liquid market size over the forecast period. Global solvents market is likely to witness significant changes over the forecast period owing to increasing environmental concerns and regulatory pressures over toxicity. Green solvents are used for numerous applications such as paints & coatings, printing inks, adhesives, pharmaceuticals and cosmetics. Global solvents market was estimated at over 18.5 million tons in 2014 and is likely to reach over 23 million tons by 2022, growing at a CAGR of more than 3.1% from 2015 to 2022. Green solvents account for approximately 10% of the global solvents market and are driven by government regulations to minimize VOC content into the atmosphere. Properties such as negligible vapor pressure, high thermal stability, non-flammability, low viscosity, liquid state retention over extended temperatures and high conductivity favor ionic liquids market growth for myriad applications in place of organic solvents. They offer greater flexibility in properties owing to numerous possible combinations of anions and cations. Some product types include imidazolium, pyrrolidinium, piperidinium, pyridinium, morpholinium, ammonium, phosphonium and sulphonium. The choice of anion or cation in their synthesis has profound effect on physical properties such as density, viscosity, polarity and conductivity. Reaction mechanisms such as Friedel-Craft, Diel-Alder and metal-catalyzed synthesis are reported to use ionic solvents. Imidazolium based products are also widely used in several applications such as energy storage and catalysts as it improves yield, reaction time and chemoselectivity in organic reactions. Toxicity issues over possible release into water or soil resources & become persistent pollutants and cause environmental risks are concerns faced by industry participants and which may hamper their growth. Traditional liquids such as N-alkyimidazolium, N-alkylpyridinium, N-alkylthiazolium, N,N-dialkylpyrazolium and tetraalkylammonium cations posses such characteristics. Traditional ionic liquids market price trend has been high, making it impractical for industrial applications. Technology innovation for developing product for niche applications in pharmaceuticals and aerospace is likely to provide for future growth potential opportunities. Catalysis/synthesis applications dominated the industry with an estimated valuation of over USD 150 million in 2014. They also act as solvent and co-catalyst. It is suppose to chemically react with catalyst precursor to form active catalyst complex. Products such as chloraluninates, alkylchloroaluminates or stannates are used for this application. Food applications accounted for over 11% of the total ionic liquids market size in 2014 and are likely to grow at significant rate from 2015 to 2022. Consumer preference towards processed foods owing to hectic lifestyle and growth in spending capacity is likely to drive ionic liquids demand for this application. They are used for purification, extraction, derivatization and separation and of biogenic compounds such as fats, carbohydrates, tannins, proteins, antioxidant flavors and pigment in food processing applications. Electronics application accounted for over 10% of the revenue share and is likely to witness above average gains up to 2022. They are used as an electrolytic medium in lithium-ion & lithium-air batteries and technology innovation are being made for their inclusion for this application. U.S. ionic liquids market size was the dominant with revenue generation over USD 200 million in 2014. Stringent government norms over organic solvents used in end-use industries such as chemical, oil & gas and pharmaceuticals over toxicity and health concerns are likely to drive demand in the region. China ionic liquids market share accounted for over 17% of the total demand in 2014. Shift in focus towards adopting green solvents over toxicity issues causing environmental problems from organic counterparts is likely to drive demand in China. This region has numerous large scale industries and is the major manufacturing hub. Adopting green solvents in this region can help to curb major environmental pollutants. Global ionic liquids market share is fragmented as many companies cater different product types to end-use industries according to specified applications. Major companies include BASF, TCI, Solvionic and IOLITEC GmbH. Other manufacturers include Scionix, Wuhu Huaren Science and technology, Sooyangchemtec Co.Ltd, Coorstek Specialty Chemicals and Santa Cruz Biotechnology. Historical data coverage: 2012 to 2014; Growth Projections: 2015 to 2022. Eco Friendliness of Ionic Liquids Market Soon to Replace Its Organic Counterpart, Rising Figures Prove.